Heat oven to 350°F (325°F for dark or nonstick cookie sheet). Line cookie sheet with foil. Cut each candy bar in half crosswise. Poke craft stick into side of each. In large bowl, mix cake mix, oil and egg with spoon until dough forms. 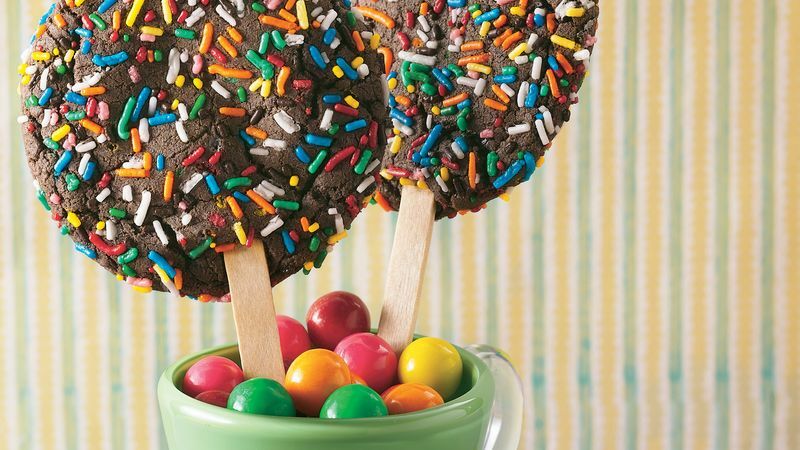 For each cookie pop, form 1 rounded tablespoonful of dough into a ball; flatten in palm of hand, and place candy on top. Form dough around candy, sealing well. Roll in powdered sugar to cover completely. Place 2 inches apart on cookie sheet. Bake 11 to 13 minutes or until set. Cookie will appear moist in the cracks. Let cool on cookie sheet 2 minutes. Remove from cookie sheet to cooling rack. Cool completely, about 30 minutes. For a bake sale, cover each cookie with plastic wrap, and tie with colorful curly ribbon. Be sure the candy is sealed in the dough so it doesn’t leak onto the cookie sheets.